Second generation roofer Stacy Stines remembers when his father started the family business in 1978 with a focus on using real wood shakes for roofs. Over the years Stines has seen a change — and a growing preference amongst homeowners for longer-lasting polymer roofing products. One such community, Valle Cay near Boone, N.C., includes 47 homes constructed in 1984 with real wood shake shingles. Due to rot, weathering and curling, many of those roofs have failed and Stines has replaced seven of them since 2008. In the heavily-wooded area the association now recommends all roofs be replaced with DaVinci Roofscapes Multi-Width Shake roofing tiles in a Tahoe blend of five shades of natural wood. “Once someone sees this product installed, they love it and want it on their own home,” says Stines. “The simulated shake roofing has a good profile and dimension to it, the color blends are terrific and the advantage of knowing you have a roof backed by a 50-year limited warranty is extremely impressive." 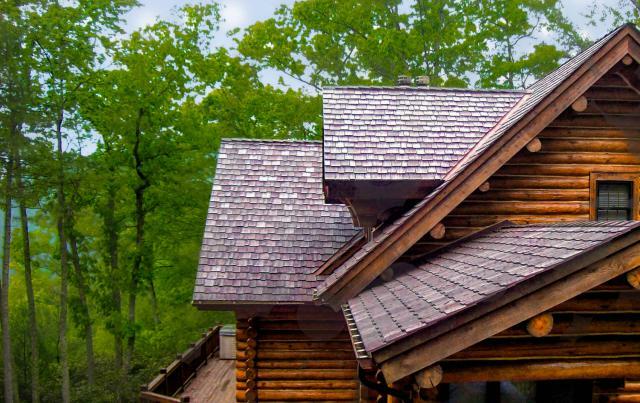 At another North Carolina community, Stonebridge Log Home community in Todd, developer Shawn Gentry has also seen a rising interest in synthetic shake roofs. Once a completely all-wood cedar shake development of 200 rustic log cabins, the community has now adopted rules that require either fake cedar shake DaVinci Roofscapes roofing products or pre-approved wood cedar split shakes for both new construction and re-roofing projects within Stonebridge. “The push towards polymer shakes made sense due to long-term maintenance and safety concerns,” says Gentry. “The wood cedar roofs on our one-of-a-kind homes are vulnerable to fire, decay damage and weather conditions. Visit What are Contractors Saying about DaVinci? to learn more about how roofing installers and experts feel about DaVinci synthetic slate roofing shingles and cedar shake alternative roofing materials.